In TV land, meanwhile, it was a night for handmaids and Big Little Lies; Elisabeth Moss and Ann Dowd won Best Actress In A Drama Series and Best Supporting Actress In A Drama Series, respectively, both for their work on the night’s Best Drama Series (natch), The Handmaid’s Tale, while Laura Dern, Nicole Kidman, and Alexander Skarsgard all won for the similarly recognized Big Little Lies over in the limited series category. 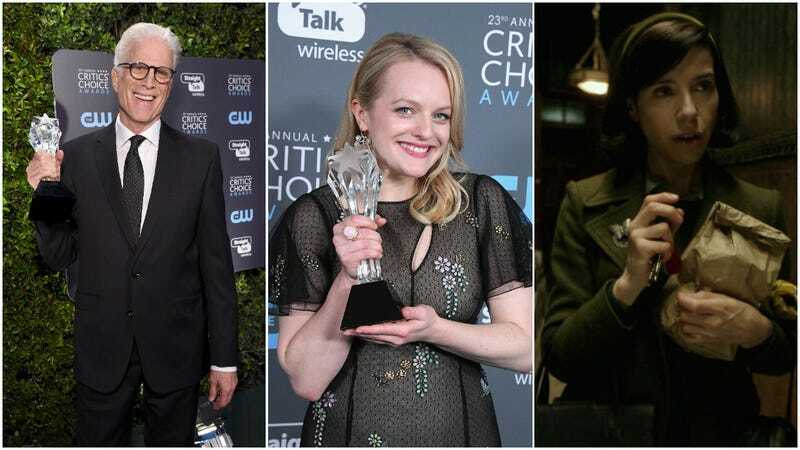 Ted Danson, meanwhile, was rightly recognized for his work as Michael on The Good Place, while Amy Sherman-Palladino’s The Marvelous Mrs. Maisel scored both Best Comedy Series and a Best Actress In A Comedy Series award for star Rachel Brosnohan. And Sterling K. Brown continued his awards show run, scoring a Best Actor In A Drama Series win for his continually excellent work on This Is Us. You can see the full list of nominees and winners—including what had to be a surprisingly contentious Best Young Actor/Actress battle between the kids from The Florida Project, Logan, Wonder, Gifted, and Wonderstruck—over at The Hollywood Reporter.